Let’s talk about shoes! Hello ladies! In today’s blog post I want to show you best ways how to wear slip-on sneakers and look ultra chic and modern. Slip-ons are great alternatives to flats, but they do have an athletic touch that makes its wearer look sporty and smart-casual. This footwear is having a serious moment right now, so why don’t you try these functional must-haves with all your everyday essentials. So, why don’t you take an advantage of these extremely functional shoes. Scroll down to see some fresh ideas for how to style slip-ons with your casual and semi-formal outfits. 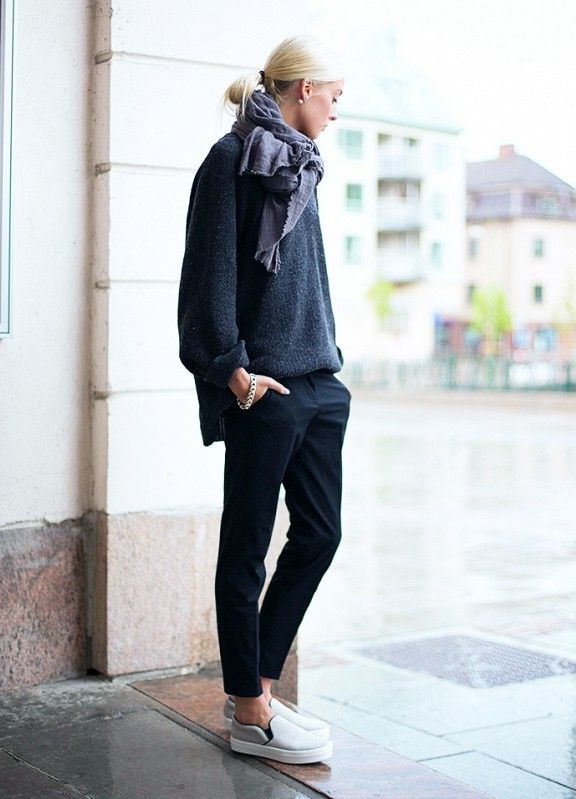 We see a stylish cardigan bomber worn atop grey sweatshirt tucked in white skinnies completed with snake-skin slip-ons. This look is casual, yet ideal for everyday walks on the town.